Hello there foodie fans! Live from the Social Media Command Center, we were fortunate enough last night to have a visit from our new best friend Norm Haney from the Tampa Tap Room! 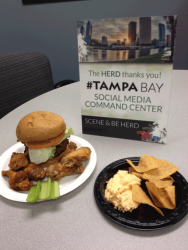 One of the many conversations we had here in the command center was when a someone on Twitter asked us what the best wings in Tampa Bay were! As you can imagine, this a s debate that went on for a while as there are so many options for great wings in the Tampa Bay area! We are all serious wing lovers and someone mentioned that the Tampa Tap Room had the best wings in Tampa Bay! 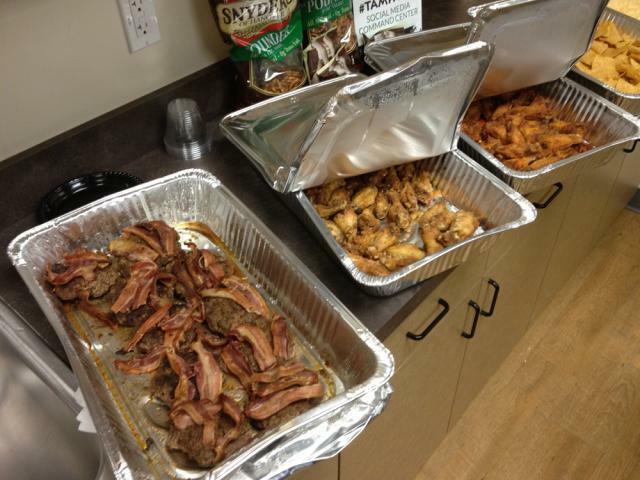 So naturally those of us who hadn&apos;t sampled these awesome wings needed to do a taste test of some sort, so we reached out to Norm at Tampa Tap Room via Twitter, and Norm, being his awesome self brought us by some of their award winning wings and burgers! Yup, I said award winning, and if you don&apos;t believe me, check this out, as not only were they voted best wings in a local poll, they also took the award for best burger, and I can definitely verify that the award is warranted! Norm and the Tampa Tap Room are located in Carrollwood at 13150 N. Dale Mabry Hwy., so be sure to stop by and sample these award winning wings, and tell the gang from the Social Media Command Center highly recommended it! Be sure to give the menu a look as well before you head over, as there is so much deliciousness to choose from! Special thanks to Norm once again for being such an awesome supporter of the Herd and the command center! For more updates on Tampa Bay dining, as always check out our website at http://www.visittampabay.com/visitors/restaurants/!